Take some time, relax, and slow down. Come as you are, bring some friends. Simple elegant luxury amidst one of the most beautiful landscapes in Australia, Promised Land Retreat is the best luxury holiday accommodation in the Bellingen / Coffs Harbour area. 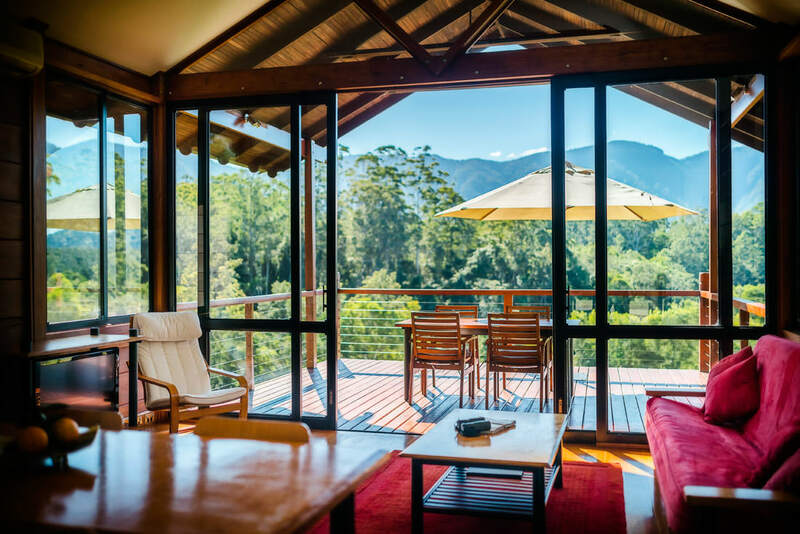 Crafted out of timber, the modern chalets offer a stylish retreat with dramatic views of the Dorrigo escarpment. The 100 acre property is a sanctuary from the outside world, and is ideal for a romantic getaway or an active family holiday. Promised Land Retreat is a short walk from the crystal clear Never-Never River, 12 km from Bellingen with its art and craft shops, cafes and festivals and 40km from Coffs Harbour. We are right in the middle of the Coffs Coast Region - a great springboard to explore this diverse and beautiful part of the World. On this website you'll find plenty of photos of the chalets, a video tour of our property, a quick tour of Bellingen Shire, and our tariffs and bookings. "We'd love to have you come and stay with us. Give us a call if you have any questions." Send a special gift of a perfectly peaceful retreat. Contact Us for more info. Promised land retreat has been selected for inclusion in the 19th edition Lonely Planet Australia guidebook. As Lonely Planet put it: "Our authors never accept freebies or favours in return for positive reviews, and travellers trust us to tell it like we see it. Your business was selected for inclusion based purely on merit"
Read unbiased opinions at TripAdvisor. Just as discretion is the better part of valour, sometimes running away is the healthiest option for life and limb. In today's mad rush and tumble a moment of calm is a valuable thing. Here we are, under the mountains, miles away from what ails you. You won't find any city lights in our skies at night, just the sound of the wind in the trees. If you recharge quickly, it's not like were in Whoop Whoop. Bellingen is 15 minutes away with its arty, musical bend and great food. The ocean is another 15 minutes beyond, with truly unspoilt beaches, and 25 minutes in the other direction you'll find the top of those mountains you can gaze at all day. But you could also just stay here and soak in the atmosphere. We cater for couples and families with our 1 and 2 bedroom chalets. All our chalets offer you great privacy and there is plenty of space to explore and wander. If you're feeling energetic, we also have our own tennis court, and bikes are provided for you to discover the area. Or you can take a walk to the river that is just a stone's throw from the edge of the property.